WOODSTOCK – A new Lincoln Inn will open soon. Under the new ownership and management of Mara Mehlman, the Lincoln Inn located at the covered bridge about five miles west of downtown, has undergone renovations. The floors have been redone, the walls given a fresh coat of paint, and the inn is now open for business. Mehlman said she had spent the past few years in Great Britain, but wanted to return to the U.S.
She recalled a visit to Woodstock about seven years ago. “I told myself, ‘Oh, my God, it’s so beautiful here. Someday I’ve got to live here,’ and now I live in Woodstock,” she said. Mehlman said the two spent plenty of time in local restaurants to determine what area customers like in their dining. She also had high praise for Saramova’s plating. Saramova also had a lot to say about the décor and she is in the process of transforming the kitchen to her specifications. Thus, the dark blue walls of the previous incarnation of the Lincoln Inn are gone, replaced with a more welcoming olive green, giving the restaurant a Colonial flair. “Everything has to be right,” said Saramova. “I spent two weeks renovating the kitchen myself. We’re planning a soft opening,” which is scheduled for Friday, Sept. 26. One important change: the tavern will be open to the public. Saramova said the restaurant would likely be closed on Mondays. Mehlman said she would like to stage events for the general public. She said a classic car show might be a possibility; she herself has a 1961 Studebaker, which has been well cared for. Mehlman said she might welcome authors reading from their books among her events. For more info visit, lincolninn.com. 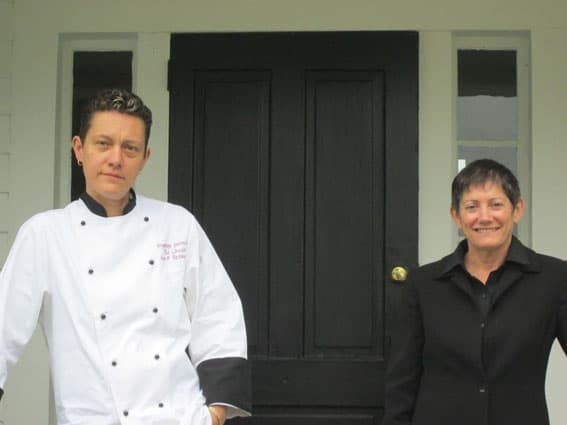 New Chef Jevsenija Saramova, left, and owner Mara Mehlman, right, re-open the Lincoln Inn with a renovated tavern that will be open to the public.